Here at Stone Valley, we have over 25 years' of experience helping our customers in Wokingham and the surrounding areas, turning their gardens into beautiful, relaxing havens that they can enjoy all year round. Our team of landscape gardeners are happy to help on all sizes of projects. Whether you want to install new decking, add a new driveway or perhaps install a patio area in your garden, please get in touch with us. "Great quality work. Dave and his two apprentices put in a new patio in the back gardne and also dug out my overgrown borders. He also dug out the foundations of an old greenhouse and lay new turf. The work was done to a very high standard you get the impression that Dave is a perfectionist. He worked really well. Ran to time and budget." 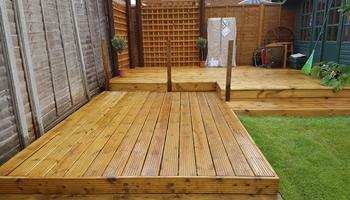 "Did a really great job of clearing and preparing an area which had been left in a complete mess by builders. Transformed the area in 4 days - included turfing, installing trellis, planting a laurel hedge and some alterations to the paving. Also planted some quite substantial trees. Everything was really good quality and is thriving! Very organised with deliveries arriving on time and nothing too much trouble. Very reasonable quote and no extra charges, would thoroughly recommend." "Second time we have used Stone Valley - over 5 weeks this time renewed a long fence, dug out a sunken seating area which had patio and trellis, put in a large base sunken for a shed and finally large patio area renewed, extended front and back. Dave and his team were polite, hard working, consulted fully, offered good advice. All work completed to a high standard." For more information, please get in touch. You can e-mail us or call us on 01344 459664 or 07725 965770.